In our previous piece we focused on signs of liquidity issues at China Oceanwide including spiking debt levels, negative operating performance, and the aggressive pledging of equity in its subsidiaries. Today we share a deeper-dive into Oceanwide’s operations, including an overview of its leverage-fueled trophy asset development spree which has shown recent signs of stalling. We have also identified accounting red flags, including Oceanwide’s booking $11.4 billion of “development costs” as a current asset, as well as $4.8 billion in questionable related-party receivables. Bloomberg recently reported that a key Oceanwide operating subsidiary was “scrambling to sell assets to repay debt.” With another $1.6b of bond maturities due in Q1’19 we expect significant near-term instability and ultimately expect the conglomerate to unravel within 24 months. Given its liquidity issues we do not think China Oceanwide will fulfill its commitments to Genworth & its policyholders and reiterate our view that this deal looks starkly at odds with the interests of policyholders. In our previous piece we highlighted signs of liquidity issues at Genworth’s emergent acquirer, China Oceanwide (“Oceanwide”). In particular we focused on Oceanwide’s (i) consistently negative operating & investing cash flow (ii) spiking debt levels; and (iii) the aggressive pledging of equity in Oceanwide’s public subsidiaries, which have all steadily declined in value. Today we are sharing a deeper-dive into Oceanwide’s operations, including an overview of the conglomerate’s leverage-fueled trophy asset development spree, which has recently shown signs of stalling. 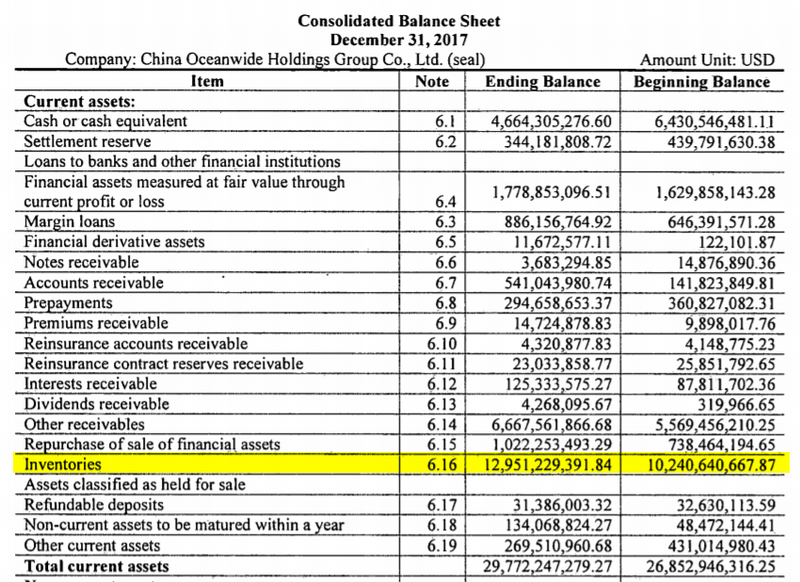 We have also taken a closer look at Oceanwide’s audited financials, identifying red flags with its working capital balances including (i) the reporting of $11.4 billion of “development costs” as a current asset; and (ii) the reporting of $4.8 billion in questionable related-party receivables as a current asset. Finally, we review Oceanwide’s debt maturities, with a particular focus on a large $1.6 billion slate of bonds due in Q1 ’19, just after the hoped-for Genworth deal closing. Collectively this analysis bolsters our view that Oceanwide is overleveraged and facing a severe and current liquidity crunch. The nearly unlimited access to credit the conglomerate has enjoyed historically has recently tightened. If the Genworth deal were to close we believe it would buy Oceanwide some additional time, but we do not see it materially altering Oceanwide’s collision course. We predict that China Oceanwide will collapse within 24 months barring a financial miracle. The key question facing regulators right now is whether the Oceanwide deal will leave Genworth’s policyholders better or worse off. The consensus seems to be that Genworth is a financially weak holding company. Many have taken the view that if Oceanwide can contribute some cash to Genworth’s insurance carriers then it would be better than nothing. We think that view is misguided, and that the opaque Chinese conglomerate is not coming to the rescue. On the contrary, given the financial state of Oceanwide we expect the opposite will take place. The current deal proposal relies on Oceanwide largely contributing capital to Genworth after the deal closes. Similarly, Genworth is slated to contribute capital to its primary insurance carrier, GLIC, after the deal closes. We expect these IOU’s will never materialize. Instead, we think Oceanwide is more likely to contribute a token amount up-front then seek any available means of extracting capital out of Genworth in an effort to stay solvent while policyholders are imperiled in the cross-border fallout. For this we turn to Oceanwide’s working capital balances (i.e. : current assets minus current liabilities). As of 2017 year-end the conglomerate had working capital of over $10 billion, suggesting ample liquidity to meet its obligations, at first glance. By recording almost $13 billion in inventory as a “current” asset the implication is that the balance can be converted into cash within a year or less. Why is Oceanwide carrying so many development costs as “current” assets? As noted earlier, the balance has just grown over time regardless of sales movements. It seems that for the past five years very little of its real estate projects have been sold or converted into rental units, yet they continue to be carried as “current”. Just how many properties are there that have yet to be completed, and what are they? The above casts serious doubts about the credibility of “development costs” as a working capital asset. It may also cast doubt on the credibility of the reported number in general. At the very least, it raises questions about how Oceanwide is deploying its resources. Negative working capital is a sign that a business could have trouble paying its existing debts when due and payable. In Oceanwide’s case, it has to pay these debts and then fund the $2.7 billion acquisition of Genworth along with its subsequent funding commitment to Genworth and its insurance carriers. After identifying Oceanwide’s extensive development cost balances we sought to learn more about its property endeavors. We learned through media reports and subsidiary filings that the conglomerate has been developing multiple large “trophy” assets. Putting aside the wisdom of pursuing these splashy projects, the size and number of these simultaneous developments tells us that substantial new capital will be needed to see them through to completion. Oceanwide is in the process of building the second largest office tower in San Francisco, a 905 ft. skyscraper in the heart of the city. The building complex is to include 2 million square feet of mixed-use office and residential space. The company had purchased the site for $300 million from private equity investors that had paid only $113 million for it two years earlier. BizJournals recently reported that the development is the most expensive construction project in all of San Francisco, with construction costs expected to be in the $1.6 billion range. Oceanwide began construction near 2016 year-end, with construction slated to be completed in 2021. In Los Angeles, Oceanwide has embarked on a $1 billion development to build the three tallest residential buildings in the city’s skyline. The luxury projects are slated to be completed in 2020. In September, a Bloomberg article on Chinese junk bond sales noted that the Oceanwide subsidiary responsible for many of the trophy-asset developments was “scrambling to sell assets to repay debt.” The entity is the developer for the Los Angeles and Indonesian endeavors mentioned above. In 2015 Oceanwide paid $390 million to purchase two sites in New York’s South Street Seaport, with plans to construct a 1,400 foot “supertall” tower on the location. The Real Deal reported that the company filed demolition plans for the sites in early 2017, but as of April 2018 no building plans had been filed with the city’s Department of Buildings. The publication referred to the situation as a “mystery”. 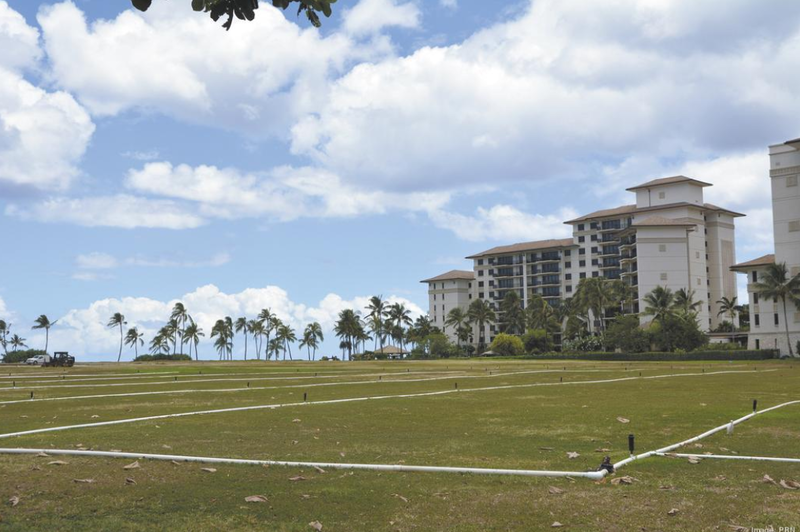 In 2015-2016 Oceanwide spent a total of about $614 million on land purchases in Hawaii (pg. 16-17) in order to build an ultra-luxurious hotel under the Atlantis brand along with two other hotels, residential condos, and commercial space. The projects look to have stalled. In mid-June of this year it was reported that the projects are still in the “early design and planning process” with the sites sitting idle. Each of these construction projects have costs to complete that are not fully disclosed in the financial statements and could amount to billions of dollars in additional financial commitments. So, Oceanwide will need funds to address its working capital needs (which includes $11.4 billion in questionable “development costs”), its $2.7 billion Genworth acquisition, and an unknown amount to fund these and other construction projects that are currently in various stages of development and pre-development. After all this, what is left for the Genworth policyholders? Turning back to the financials, we see other working capital red flags aside from unusually large inventory levels and apparently stalled development projects. This item struck us as odd because of its size relative to the operating performance of the conglomerate (it’s almost twice as large as total 2017 revenue). Additionally, “other receivables” ballooned by almost $1.1 billion from 2016 to 2017 despite a year over year revenue decline. Thus we can surmise that at least $4.8 billion of “other receivables” is owed by related party entities. Much of these were up-streamed to Chairman Lu’s other entities. Instead, it looks like “other receivables” is simply a mechanism to make unsecured loans to Chairman Lu’s other entities. What is the credit worthiness of these receivables? If almost $2.7 billion is owed from related entities with limited operations of their own what is their capacity to actually pay the money back? 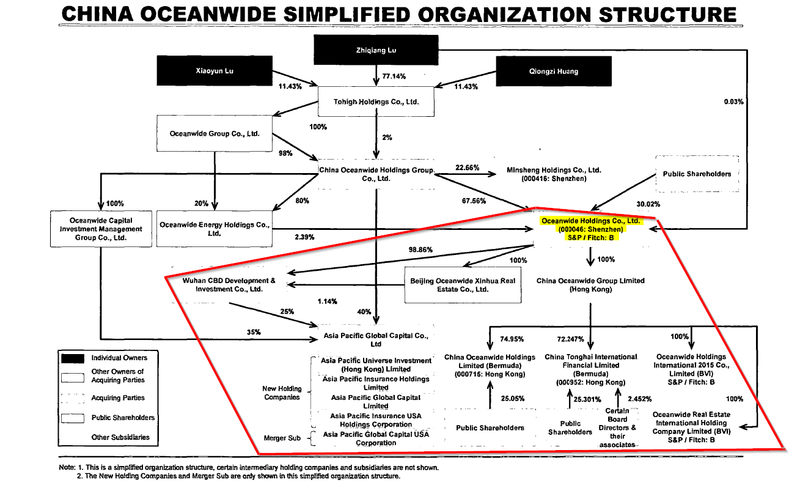 Why is Oceanwide functioning as a de facto bank for these entities? Do these related entities lack the credit worthiness to get their own financing? What are the terms of these receivables? 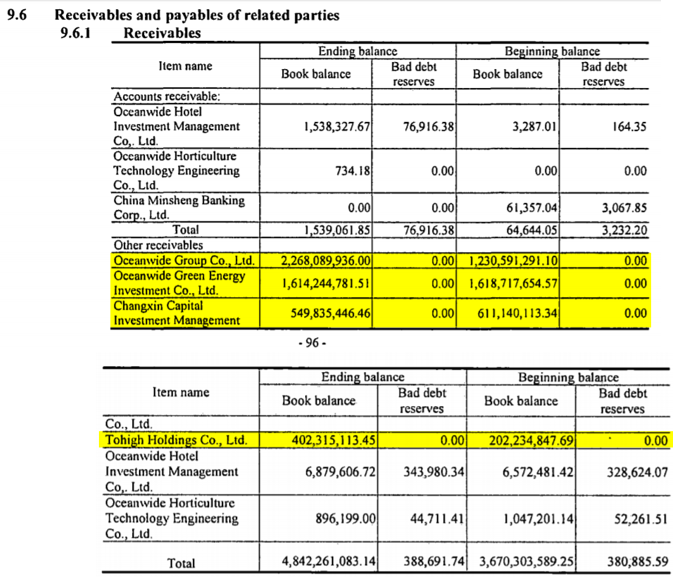 Are these interest-bearing or are they simply unsecured, interest-free loans to the Chairman’s entities? Why have these receivables steadily grown over time rather than been paid off? To answer some of these questions we may wish to explore Chairman Lu’s personal spending habits. …last spring, Mr. Lu tried to buy an even pricier home, offering $41 million to buy the former home of Jim Clark, co-founder of Netscape, according to court records and a person familiar with the matter. …(Oceanwide) also paid $41 million for a ranch in Sonoma County that can hold a winery. These are only the assets we were able to identify via domestic media outlets. It is unclear how many mansions and other creature comforts Mr. Lu has accumulated globally at this point. 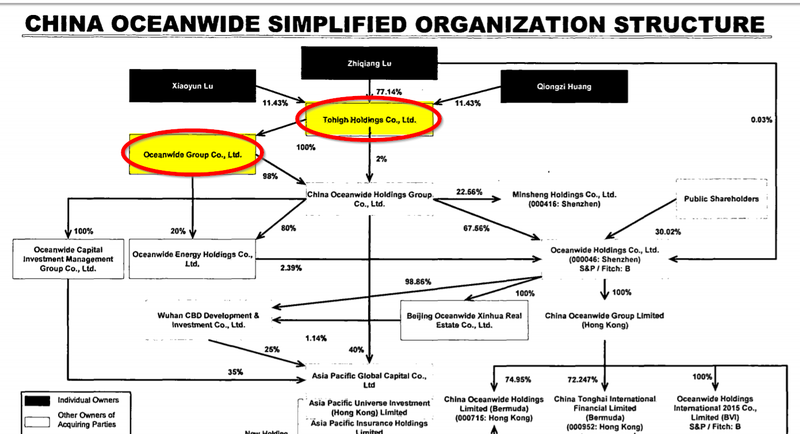 We wonder, why is the Chairman purchasing so many foreign mansions clustered in the same California town? It begs the question of whether these are merely attempts to shift assets overseas. At best it does not paint a portrait of a staid, judicious asset manager. Instead, such spending is more reminiscent of the teenager who managed to get a hold of a parent’s credit card. Thus, net of restricted cash the conglomerate had about $3.4 billion in unrestricted cash with which to meet its obligations at the end of 2017. Given the trend of negative operating cash flow, a high current debt burden, and the aggressive development slate we can only guess what the 2018 year-end cash balance will look like. We expect Oceanwide to continue to face substantial refinancing pressure, and believe the prospect of meaningful deleveraging is still remote. This is due to the company’s very high short-term debt and its overall huge debt burden. After robust activity for more than two years, the momentum waned in September and October, traditionally prime months for Chinese property. …A downturn for such a cyclical sector has been widely anticipated, but the timing is particularly bad since credit conditions aren’t conducive either. …The financing landscape is the most unfavorable in years–whether it’s a clampdown on alternative financing, domestic bonds being designated only for refinancing, or a surge in offshore bond yields. Moreover, many developers have large refinancing needs due to surging maturities or exercisable puts on onshore bonds. Smaller developers will certainly have to endure higher coupons. In some cases, depleted investor demand will also make new issuances altogether unfeasible. …Most rated developers are actually likely to increase market share by picking up assets from more-stressed peers, while the weakest face a real possibility of collapsing. The conglomerate has relied on short-term debt to fuel its expansion. 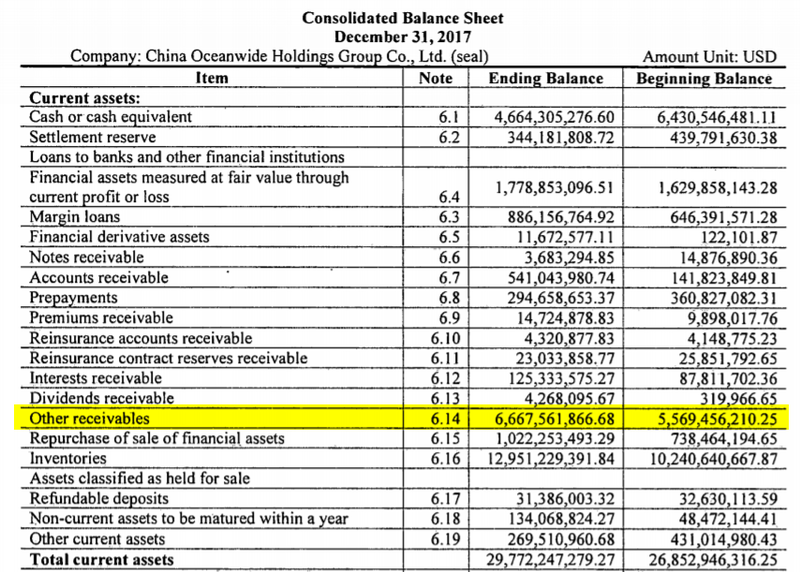 The duration of Oceanwide’s $7.5 billion in bonds is only ~3.6 years. The Genworth deal’s targeted closing (Q4 of this year) comes right before a slew of $1.6 billion in bonds come due in Q1 ’19. In addition to the scheduled Q1 ’19 bond maturities, Oceanwide has recently rolled debt by issuing new short-term obligations. The S&P release noted that Oceanwide repaid offshore senior notes and domestic corporate bonds this year by obtaining an RMB 11.6 billion (US$ 1.6 billion) one-year loan facility and by seeking support from parent China Oceanwide. The upcoming Q1 ’19 bond payments look to present a daunting hurdle given the conglomerate’s recent struggles to juggle multiple debt repayments and other financial commitments. The conglomerate faces about $3 billion in new bond maturities for ‘19, not counting any additional debt rollovers or short-term liabilities that may have been pushed-off from this year. Oceanwide will need funds to support (i) its working capital balance (which includes at least $16.2 billion in questionable “development costs” and related-party receivables); (ii) billions in construction projects that are currently in various stages of development and pre-development; (iii) its looming multi-billion bond payments; and (iv) the $2.7 billion proposed Genworth acquisition. This is all in the face of negative historical operating cash flow and tightening credit markets. After all this, will Oceanwide be able to make good on its promises to contribute $1.5 billion to Genworth “over time following consummation of the merger”? In our view, that is the key question underpinning this proposed transaction. We think the answer is a clear ‘no’. We hope the regulators take the signs of financial distress at Oceanwide into consideration as they weigh the decision for Genworth’s policyholders. We reiterate our view that this deal looks to be starkly at odds with the best interests of policyholders. Disclosure: I am/we are short GNW.